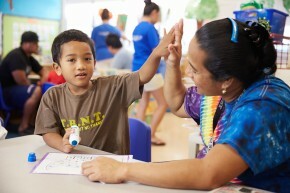 Great progress is being made in Hawaii to drive educational success. Hawaii was the only state to see significant improvement in both reading and math scores of fourth and eighth graders, according to the National Assessment of Educational Progress’ Nation’s Report Card, released in November 2012. Hawaii now has new standards in early education so more children are prepared for kindergarten and on track to read at grade level by the third grade. Students from kindergarten through twelfth grade are being taught to think critically and apply their knowledge to real world situations with the Hawaii Common Core standards. And college students are encouraged to earn the credits they need so they are able to graduate on time. This section is dedicated to sharing the stories of Hawaii’s significant progress toward reaching its 55 by ’25 goal.